The comedy brought to the interview was not completely on their own accord, as the two showed up to the interview higher than a plane. The poor interviewer looked confused when he heard the answer to the simple question ‘have you had any personal bromances in your life?’ However, Jason couldn’t give an easy answer, and began giggling away to himself as he began talking about his imaginary friend that he has had since he was twelve years old. Paul Rudd added extra fuel to the fire, by suggesting that the friend’s name is ‘Gideon’, and that this ‘friend’ rides a unicorn. If you didn’t think this childish comedy could get any worse, shortly after the fits of laughter, Rudd gets up and grabs a headless mannequin and begins tormenting Segal. However, Segel brings himself back to reality and answers the question properly. As the interviewer chuckles along nervously, he tries to swiftly move on from the question, by mentioning how hard it’s going to be to edit the footage from the interview. 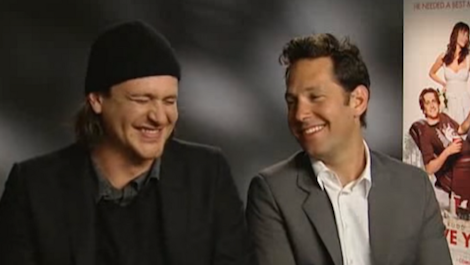 Although the interview is nearly 10 years old, it’s ever so relevant, as these two know not to take life so seriously, even if they are working on the promotion for a multi-million-dollar movie. It shows a different side to celebrities, that many of us don’t see anymore, as they are never pictured as normal human beings who like to have fun once in a while, only the serious A-list celebrities that look down on the rest of us. There have been a few other interviews with different celebrities that also grabbed headline for their surreal behavior. Take Tom Cruise jumping around on a sofa after expressing how madly in love he is with Katie Holmes, or how about when British DJ, Chris Stark, interviewed Mila Kunis and was so unprepared, that he began discussing all of his drunk memories with his friends, to which Kunis replied that the interview was her best ever. Ah, celebrities, we all knew you had a funny side to you. All it takes is a few joints or perhaps a wave of emotion to get it out of you! Do you think these interviews are ever so relatable? Do you reckon all celebrities should take note of these comedic geniuses? Let us know in the comments, or on Twitter at @WhatsTrending.